I had never thought of the world this way before; never imagined that every day objects and activities could be beautiful, creative and/or thought provoking depending on the context in which they were presented and an individual’s intention. Artists know this intuitively; it’s what they do and how they live. When I was younger I often used to write my shopping lists on pieces of sturdy tree bark I’d find in the woods. (Don’t roll your eyes; I had a lot more time on my hands back then and my sister was a hippie.) When my doorknobs looked empty, I’d paint them to resemble a design you might find on a Clarice Cliff teapot. Leftover pieces of colorful ribbon were curled around cans in the pantry; masses of flowers were hung upside down to dry from a ceiling rack in the laundry room so that it felt like I was folding clothing in Alice’s Wonderland. This all started because I was lucky enough to take a trip to Paris with my family when I was fourteen. As I straggled behind them on one of our daily walking tours, I happened upon a storefront grocer’s window. There I saw a small wooden crate, about 12 x 12 inches, standing upright but slightly tilted back for the viewer to see its contents easily. It was divided into nine squares, three per row. Nine green pears were displayed in their individual cubbyholes, every fruit nestled in crisp lavender tissue paper that peaked out around each pear. It stopped me dead in my tracks. The ordinary made extraordinary. I had never thought of the world this way before; never imagined that every day objects and activities could be beautiful, creative and/or thought provoking depending on the context in which they were presented and an individual’s intention. Artists know this intuitively; it’s what they do and how they live. But up until that Paris-pear moment, I had relegated these kinds of experiences to the galleries and museums my parents took us to and had not connected its relevance to my everyday world. I was reminded of this vital life approach when I visited the Postal Art exhibition, “The Unexpected: Art in Transit” at Ringling College’s Basch Gallery, up until November 28th. 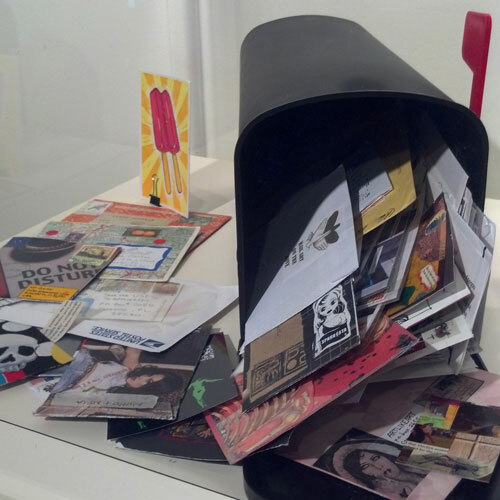 Organized and installed by six Ringling students enrolled in Professor Mark Ormond’s course “Contemporary Art and Role of the Curator”, the show began as a call to artists from the International Union of Mail Artists, a few of whom are included in this show (http://iuoma-network.ning.com/). Time constraints turned this into a loan exhibition representing fifty artists, but primarily art from the collections of Sandra Lefever and Sarah Carter. 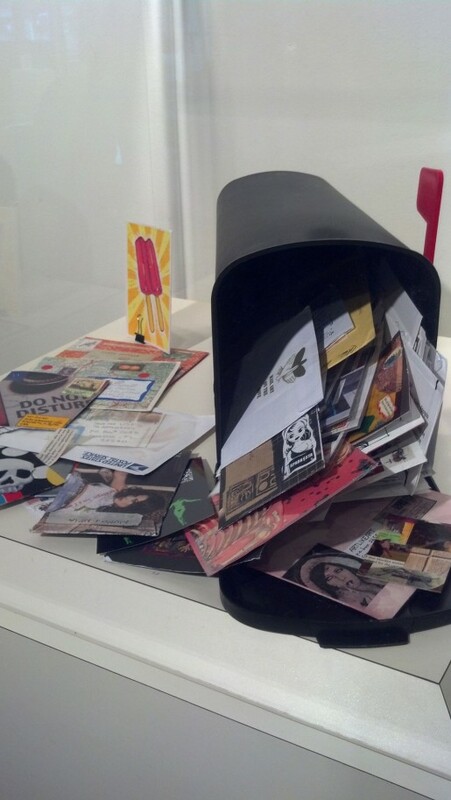 On display is the correspondence (the artwork itself) that has been mailed between the artists in this show over several years. Some are shown on the wall or on stands. 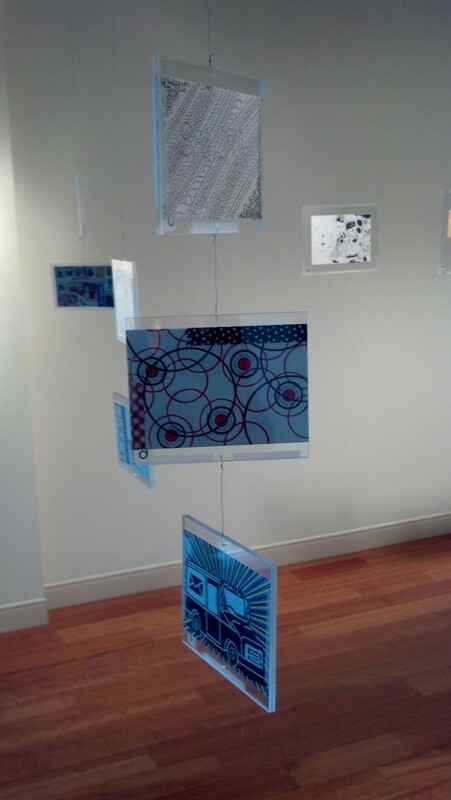 The most interesting displays have the correspondence dangling in clear frames suspended in the air like mobiles, so that both sides of the Postal Art can be seen. This is a highly effective and beautiful reminder of the art-in-transit theme of this exhibition. A letter, a pear, just everyday things… it all depends on what you do with them. Finding truth and beauty in simple ordinary things requires a humble (ego-less) way of seeing and being in the world. It is not only an intuitive behavior but a peaceful one in that one senses a connection, a tender relationship between the simple object’s presence and one’s own. I truly believe that if we could train ourselves to look at the world in this way there would be less violence and more compassionate communication. You don’t have to be an artist to empathize with everyday reality; you just need to be an open and aware human being. Thanks Ms. Beck for taking the “junk” out of junk mail. Very interesting & also very different. Great!!. The sad thing is that snail mail is becoming a source of the past. Mobiles have always represented passage and the delivery of the mail seems appropriately displayed in this manner. I have always been entrhralled with Art postcards. When Amy would come with me to Antique Shows, she became intrigued with old Postcards. All through her very young and teenage years she collected boxes of these unusual cards (Many are very valuble in today’s market). I will definitely go to this exhibit when I return to Sarasota. I am sure to love it.